The Kenya Society of Anaesthesiologists (KSA) and Critical Care Society of Kenya (CCSK) are pleased to invite you to the 27th KSA and 7th CCSK Conference at the RMK Conference Center at the Lake Naivasha Resort on 21st to 23rd August 2019. In order to facilitate the successful planning of yet another meeting, we call on to register for both the pre-conference workshops and conference. Further to that, kindly note that we will be sharing with a list of activities things to do in and around Naivasha. Karibu as we look forward to having yet another successful meeting. Limited slots available on a first come first serve basis. Each exhibition booth includes registration for two exhibitor representatives*. Daily catering in the exhibition hall (morning and afternoon tea and buffet lunch). * All signage is subject to approval and must be supplied by the partner organization. • Exclusive naming rights to the chosen workshop. • Opportunity to provide your own signage at the workshop. 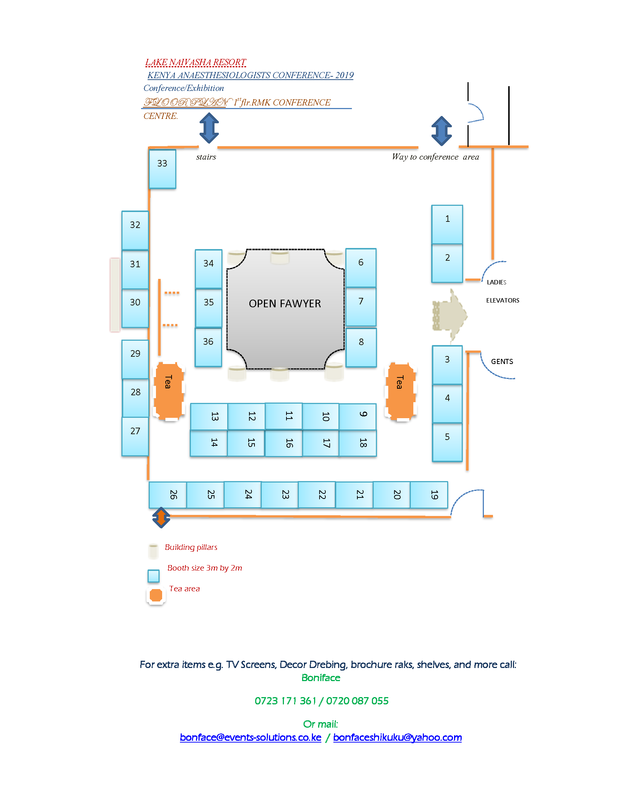 • One complimentary exhibition booth measuring 3m x 2m (includes two exhibitor registrations). • Up to 30 minutes; program subject to the approval of the conference scientific committee. • Hall rental, standard audio/visual equipment, display table. • The symposium will be included in the conference program. For booking at any of the above hotels, kindly contact Samson Kariuki, who will through reservations@lakenaivasharesort.co.ke and/or 0725211985. Don’t forget to mention that you are a KSA 2019 Delegate to enjoy these rates.